The Voice GH, a youth group that seeks to address some social issues affecting Ghanaians, has tutored pupils in selected disadvantaged schools to improve their reading skills with the launch of its ‘Help-a-child Read’ project. The project was primarily initiated following the decline in the quality of basic education particularly in slums and less endowed communities. Among other things, the project seeks to improve literacy amongst the targeted pupils; and also geared towards encouraging the youth to volunteer and collectivity help improve the quality of reading among kids. Members of ‘The Voice GH’ as part of the project, visited some slums in the national capital Accra, where they identified weaknesses in the quality of teaching and learning largely due to inadequate infrastructure, and low staff numbers. The week-long project mainly focused on pupils in the upper primary level in the selected schools where pupils were tutored in reading with the intention to improve their command of the English Language, which remains Ghana’s official medium of instruction. 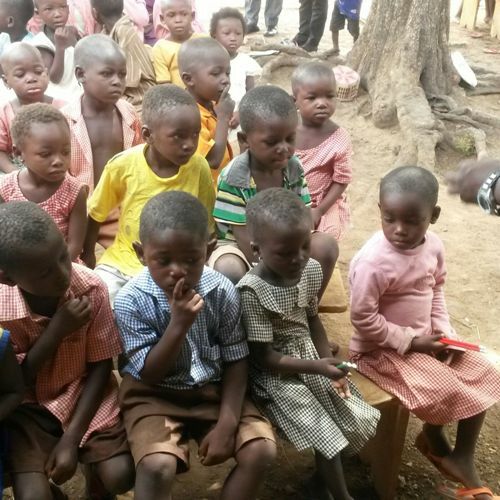 Following the success of the ‘Help-a-Child-Read Project’ in Accra, ‘The Voice GH’ replicated the initiative in some rural areas in northern Ghana, specifically in the Upper West Region, where both young and old were schooled on the need to develop the habit of reading. In all, three communities of Nandom, Lawra, and Jirapa benefited from the project. The pupils of the seventeen participating schools were taught how to read and write. The schools were presented with textbooks, exercise books, pens, pencils, and other educational materials worth GH¢7,000. The children were also offered free food and clothing. ‘The Voice GH’, the brainchild of Ms Adelaide Yiriyelleh, a student of the Kwame Nkrumah University of Science and Technology (KNUST) set in motion when she came into contact with other like-minded young people who shared in her dream and were driven by passion to positively impact the younger generation. Besides the ‘Help-a-Child-Read Project’, the ‘The Voice GH’ since its inception embarked several other projects that are of immense benefit to society. One of such is the “SPEAK…Say No to Domestic Violence” Project, a cyber-campaign intended to create awareness about domestic violence; and to educate the general public about the menace in the society. The campaign focused on vices such as Men cat-calling women in the street; the upload of pictures of naked women unto the internet without their consent and the support of the pornographic industry which routinely demeans and exploits women. The Voice GH believes the culture which glorifies an idea of male dominance, is to blame for the persistent inhumane, harmful and unimaginable experiences women go through. To get the public actively involved, the public was requested to join, follow and support the cyber campaign of ‘The Voice GH’ by taking a picture with their hands crossed and sending them to the campaign pages on Twitter and on Facebook. People were also encouraged to speak up by sharing their stories with the rest of the world to help others. The Voice GH also embarked on a two-week cyber campaign on awareness creation on autism. The campaign largely took place on social media platforms such as Facebook, Twitter, Instagram, WhatsApp, Tumblr with the hash tag #ispeakforautistickids. It took the form of short written messages and videos on autism spectrum disorders. The messages centered on life stories, experiences from members of the general public and the elite community advocating support for autistic children. It also encouraged the general public to participate by downloading the campaign logo and sharing it on their social media platforms. “This we believed helped educate and integrate people on the fight against the discrimination and violation of the rights of people with autism in our society” The Voice GH Founder, Ms Adelaide Yiriyelleh noted. She added that the campaign also involved massive awareness on media platforms across the country through write-ups in the print media as well as studio interviews on some television and radio networks. Join a worthy cause. Interested in supporting us The Voice GH? Do you want to volunteer? Do you want to speak up? Then follow us on Facebook www.facebook.com/pages/The-voice-gh/585436028176265 or search for The Voice Gh on Facebook. You can also follow us on twitter @theVoicegh.